Win an iPad or Galaxy Tab from Waze and CrackBerry.com! Download and install Waze from your mobile browser. Drive around with Waze and collect "Road Goodies" - which basically just means drive over the CrackBerry logos as you move about your city. As you can see above, they are *everywhere*. It's a competition between iPhone users, Android users, and BlackBerry users - which is to say you're up against the kids from TiPb and Android Central. Whichever site whose users collect the most Road Goodies will win and be able to give a tablet away to one of their users - selected randomly from amongst the top 25 collectors. 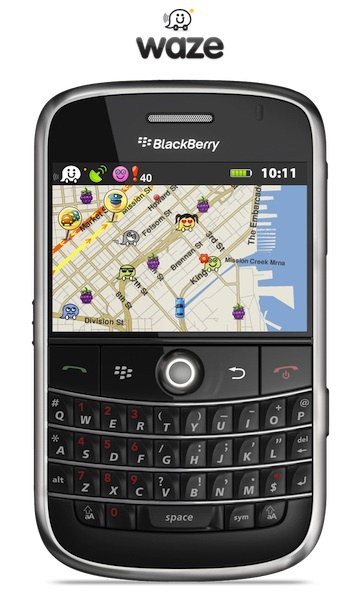 Remember - you only get credit for driving over the CrackBerry icons. What's Waze, then? It's a free social mapping tool: you can get directions, find out where the traffic is, ping other users, and generally find your way around while helping other Waze users get better location and traffic information. Check out the full details on the Waze Blog.